The Latin School of Chicago provides its students with a rigorous and innovative educational program in a community that embraces diversity of people, cultures and ideas. Latin inspires its students to pursue their passions and lead lives of purpose and excellence. developing the financial and physical resources to support the school's needs. 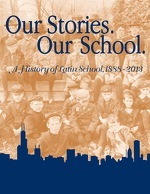 Latin is one of the oldest independent schools in the city of Chicago. Latin School was formed in 1888 when a group of parents in Chicago enlisted Mabel Slade Vickery, a teacher from the East Coast to take charge of a new, parent-owned school. The first class consisted of 10 boys approximately 10 years old. The school was designed to provide students with a rigorous college-preparatory education in the classical tradition, with a curriculum that was heavily influenced by Classical studies and the study of the Greek and Latin languages, hence the name “Latin School." Read more about Latin's history in the 125th Anniversary edition of Latin Magazine. Latin language is still taught in the middle and upper schools today.